Life is full of wonderful surprises, amazing people to share it with and combined to create a heap of laughter. Remind yourself and the rest of the household that life shouldn’t be taken so seriously and to embrace what we’ve got with this inspirational Hanging Quote Sign from Transomnia. 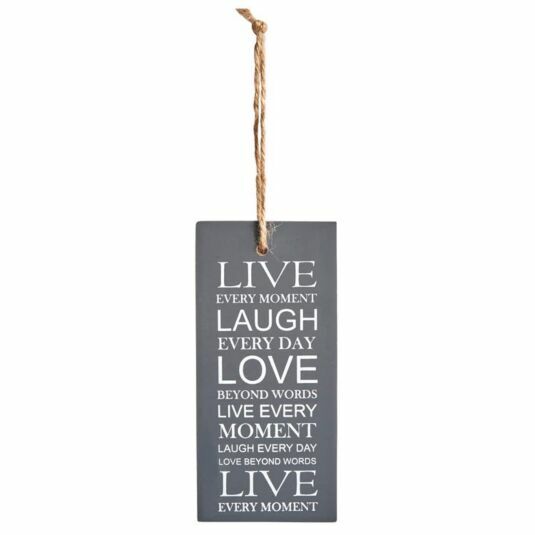 This Live, Laugh, Love hanging sign is the perfect addition to any home, creating an empowering message for all to follow and be inspired with. The sign itself hangs portrait in length and is made from a thick piece of wood. This quote is then repeated for a second time below, with the words ‘LIVE’, ‘LAUGH’ and ‘LOVE’ all featuring in a larger font than the other text. The sign features a hole towards the top of the piece through which a piece of rustic yarn is looped for you to hang the sign throughout the home.